Ronald Trent Anderson studied at the University of Wisconsin, earning his B.S. degree in Art Education and his M.F.A. degree in Art. He recently retired as an art educator, following a 38 year teaching career, which included schools and colleges in Illinois, Nova Scotia and Massachusetts. In 1998 Anderson was one of just six art educators nationwide to receive the Marie Walsh Sharpe Fellowship from the National Art Education Association. 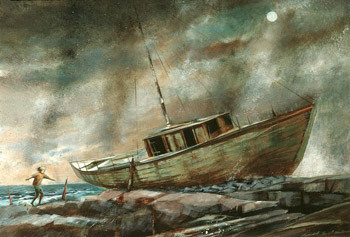 The following year he was named Massachusetts Art Educator of The Year. In 2001 he was recipient of a School Of Education Alumni Achievement Award from the University of Wisconsin - Madison. Club's 2005 Members Art Exhibition in New York City. For this painting, Anderson initially photographed his wife, running with arms outstretched as she balanced herself amongst the stones. Her actions reminded him of a gull . . . hence the title. 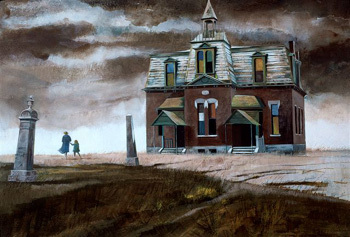 In creating "Landmark" (shown above) Anderson painted out a foreground tree, replacing it with a tombstone. He then painted the other one. "This not only strengthened the design but helped establish the mood that I was searching for," he wrote. At the 2001 International Platform Association Exhibition in Washington D.C. jurors Stephen Bennett Phillips, Phillips Collection, and Lara Murray, National Gallery Of Art, presented Anderson with the Best Of Show award for the painting.